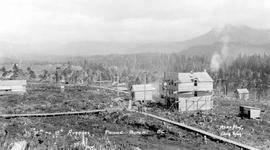 "7th and 8th Avenues, Prince Rupert, BC." 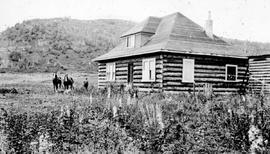 "A new settler's home near Telkwa in the Bulkley Valley". "A part of Fernie, BC"; two storey building at the front left is the Methodist church, and beside it is the parsonage. "A typical Victoria residence"; location undetermined. "Barnard Avenue, looking west, Vernon." "Barnsbury from Ganges Road"; Salt Spring Island. "Barnsbury from the Ganges Road"; the E.F. Wilson home. "Barnsbury, Salt Spring Island, built 1895." "Belville [sic] St. facing harbour"; the C.E. Redfern home on Belleville Street, Victoria, BC. "Broadway and Heather Streets, Vancouver, after the flood"; road and sidewalk have been undermined. "Bush fires on Burrard Inlet." "C.F. Shroft's residence, fruit farm, Burnaby, BC." "Captain C.R. Bull's orchard home in the Black Mountain district, Okanagan Valley".